Hodupp's has the resources to create everything from a small shed to a timber frame home.Hodupp's Timbers takes great joy in rescuing priceless hardwood and seeing it used for new structures, hardwood flooring, cabinetry, paneling, and even furniture. Hand built from reclaimed timbers of America's heartland, we can create a custom outbuilding, garden shed, or any structure you can envision. With over 300,000 board feet of hardwood in our inventory we have the resources to build your garden shed or even a timber frame home. Do you have a barn, cabin or timber frame structure in need of removal or rescue? Call Hodupp's Timbers today for a free no obligation appraisal of your structure. We have the expertise to dismantle and salvage just about any timber frame no matter its condition. 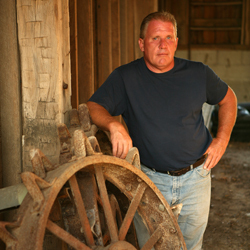 John Hodupp, owner of Hodupp's Timbers began dismantling barns in 1992. He has painstakingly dismantled over 300 barns throughout the Ohio Valley Region. Along this journey John has accumulated an unmatched wealth of knowledge on the dismantling techniques required to preserve the integrity of all the salvagable materials. In addition his unparalleled wealth of knowledge of all types of antique barnwood and the art of repurposing reclaimed lumber make him a leader in the industry. Put his 20 years of knowledge to work for you!